If we are to have a reasonable chance of managing the growth of the urban habitat, and at the same time achieve a balance of economic development with the conservation of the earth’s natural systems, we must expand our definition of the principles of sustainability, and, we must see the problem in a systems context. Since the beginning of the concepts and the language (i.e., the Bruntland Commission of the United Nations, 1987) sustainable development has consistently been represented as having three domains “the environment, economics, and the socio-cultural context” and, that they must be treated interdependently for a sustainable balance to occur. Many business and governmental leaders have been skeptical about placing any domain on a par with economics. Even those who, sooner or later, will adopt the values of living in balance with nature often find the tools within these three domains to be limited. The limitations in achieving real sustainability exist whether the scale of the development is at the micro level (such as an individual building or neighborhood), or at the macro scale of habitat (such as a city or a region of urban habitats). The designer, the planner, the developer, the civic official, or the NGO leader who is genuinely interested in facilitating a sustainable solution in the urban context will not find all the networks or ingredients, or all the information, or all the tools and alternatives for solutions within only these three domains. Consider, for example, a proposed new development which has all the finance necessary, a good environmental plan which protects and restores critical natural ecosystems, and it enhances and improves scores of lives of prospective occupants; but, it provides no dependable means of affordable transportation to places of employment for the residents. The three domains of economics, environment and socio-cultural criteria have been provided, but a fourth domain “the technology of transportation” is missing. In another hypothetical scenario, consider the same development successfully constructed, with adequate transportation technology and successfully inhabited and operated for some years; suddenly, a polluting industrial development is authorized for construction on an adjacent site, resulting in health hazards to the residents of the development. In this case, the fifth missing domain is public policy, or, the regulatory context of the habitat that would have prohibited the conflicting land use. Within these two additional domains “technologies and policy” there are numerous examples of human invention and/or intervention that can be noted to have either facilitated, or retarded community progress toward sustainability. Two extreme, and debatable, examples are the automobile (technology) and the consequences of its use resulting in threats to the natural systems, and, the principle of humans “owning” land (policy) and the consequential effect of economic speculation on the earth’s natural systems. Whether we individually value these conditions, or not, is not the key consideration. A fact of modern life is that technologies exist, that they are influential, and that they will continue to accelerate through human ingenuity. So, too, will the rules and regulations for relations among us, and our access to the bounties of the earth. Both domains are pervasive, affective, and the cause and effect relationships to the other three domains are inseparable from them. Thus, the recommended Five Domains of Sustainability are Environment, Social/Culture, Technology, Economics, and Public Policy. Further, these domains should be the organizing principles for urban administration, urban design and planning, urban growth management, and regional and urban sustainable development. The desired balance can only come from a system of values which seeks to balance and represent each of the five domains in all endeavors; be they problem identification and assessment, problem solving, design, planning, management, or administrative. Bundling of the five domains together, in both language and principles of organization, will guide these endeavors into a consistent, and constant awareness of whole-systems strategies. In the past, our institutions, our organizational structures, and our science and technologies have been approached largely through incremental, often independent, and task-centered descriptions. Frequently, such regimes of management have led to unintended, unanticipated consequences, inefficiencies, bureaucratic duplication, and very often to irreparable damages to the surrounding natural systems. Most cities of the world have organized government around the separated increments of tasks, such as education, health, justice, taxation, housing, tourism, agriculture, etc., and coordination of any of the taskdefined agencies is extremely difficult. The success in coordinated actions for sustainable development very much depends upon the skill, style, and values of individual leaders in the governmental offices. More often than not, the outcomes of planning and administration which have any similarity to truly sustainable, balanced conditions will be more accidental, and less permanent, than pre-planned and long-term. Continuity in coordination and sustainable conditions under these circumstances is extremely difficult to achieve. Assume, for the sake of discussion, that city government could be organized, not around the idea of the performance of critical tasks, but around the outcomes expectation of balanced sustainability. This expectation would be pervasive, shared by all leaders, managers, civic officials, and most importantly of all, by the public and principle stakeholders of the city. Coordination and team engagement would replace independence, specialization, duplication, and competition. Long-range planning would replace expedience, trials and errors, and indecisiveness. 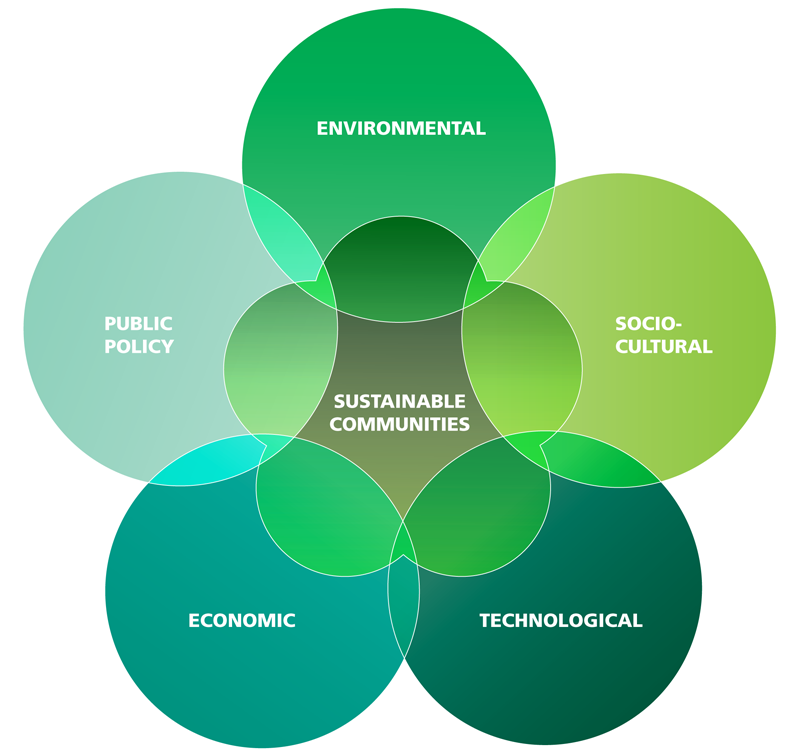 Imagine a Sustainable Development governance model which defined a council of administrators of each of the five domains of sustainability: environment, socio-cultural, technologies, economics, public policies – plus, a division of administrative services to supply the professional and special human talents required to implement and maintain the development patterns. The Sustainable Development Council leaders would have the knowledge, the values commitment, the political will, the human and fiscal resources, and the support of the local stakeholders. These attributes and resources will be necessary to implement and coordinate new visions for future development, maintenance of existing valued infrastructure, and growth management for a sustainable city, or, for a collection of sustainable neighborhoods and places. Perhaps most significant of all, it would give future generations a workable framework for development, rather than a wasted inheritance. Obviously, the already identified tasks must be accomplished. Education, for instance, is essential, but within a sustainability paradigm should not education be framed through the coordinated, interdependent, framework of the five domains? If the outcome of the city efforts in education were expected to be a) life-long in duration, b) inclusive for all citizens, c) guided by the goal of public participation in the goals of a sustainable society (or, some other broad, coordinated goals established by a S-D Council), I suspect that not only the education experiences and administration would be different, so too would the city. It is conceivable that every task-oriented agency, or department, currently defined for a city’s administration could be defined for realignment to one of the six units (five domains, plus administrative services) of a sustainable development council.